Senate President and presidential aspirant, Dr. Bukola Saraki describes as inconsequential the issue of consensus candidacy by the 12 PDP presidential aspirants. Is there a chance that all of the PDP’s 12 presidential aspirants would agree to the idea of a consensus candidate, just like that? It does not seem so, not when everyone appears to believes he has a good chance to occupy Aso Rock in 2019. Senate President, Senator Abubakar Bukola Saraki for one does not feel there is anyone more qualified than him in the PDP primaries race. He spoke to journalists on Monday in Abuja after he submitted his Nomination and Expression of Interest forms to contest the party's presidential primaries billed for October 5 and 6, 2018. The two-time governor of Kwara state insisted that he stands out from other contenders, particularly because he brings a blend of executive and legislative experience. For him, it is important that Nigeria has a president that can bring all parties of government on board in his plan. Having highlighted his unique selling point, he said: "I believe all the aspirants will work hard and see our messages to the PDP and to the people so that they can give the ticket to the best. Like I said I have great respect for all others." With this kind of confidence, it was not a surprise that he described as inconsequential the issue of consensus candidacy by the 12 PDP presidential aspirants. "I don't think the consensus thing is the issue before us because we are trying to ensure that there is internal democracy in the system and a very credible primaries. "What is important is that at the end of the day we have something that is rancour free. What I can tell you is that we are working together because we are still part of one family. "I believe at the end of the day, we will have a process that whoever emerges will be supported by all of us. So that there will be no need dividing ourselves," he said. 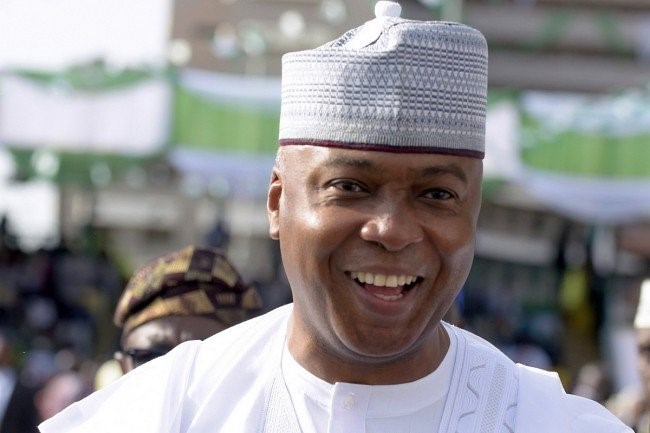 Besides Saraki, others in the race for the presidential ticket of the PDP are former Vice President, Atiku Abubakar; Sokoto State Governor, Aminu Tambuwal; Gombe State Governor, Ibrahim Dankwabo; former Governor of Jigawa State, Sule Lamido; former Governor of Kaduna State, Ahmed Makarfi; and a former Special Duties Minister, Tanimu Turaki. Others are a former President of the Senate, David Mark; a former Governor of Kano State, Rabiu Musa Kwankwaso; a former Governor of Sokoto State, Attahiru Bafarawa; a former Plateau State Governor, Jonah Jang; and a former lawmaker, Baba Datti Ahmed.